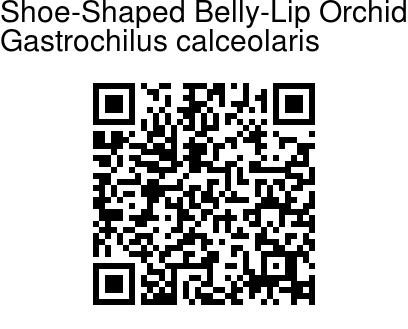 Shoe-Shaped Belly-Lip Orchid is a critically endangered orchid growing on trees, having leaves arranged alternately in two opposite vertical rows. 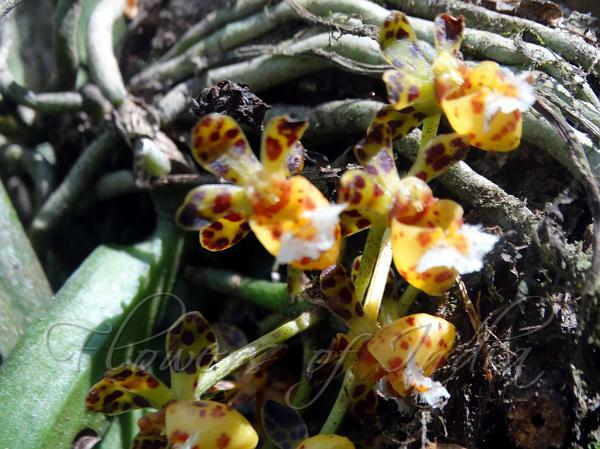 The generic name Gastrochilus means 'belly lip'. This name was coined by the Scottish botanist David Don in 1825 due to the fact the lip looks blown up like a beer belly. Blade is often sickle shaped, narrowly oblong, slightly fleshy, tip blunt and unequally 2-lobed. Inflorescences several to many, from upper part of stem, opposite to leaves. Flowers broadly opening; sepals and petals yellow, with purplish brown patterns. Sepals, obovate- oblong, 7-8× about 4 mm, base contracted, tip blunt-rounded. Petals are similar to sepals, slightly smaller, tip blunt-rounded; lip with an epichile and a saccatehypochile; epichile spreading forward, nearly round-triangular or lunate-triangular, 2-3 × 5-7 mm, above with long white hairs except on yellow and purple-spotted central cushion and with a cavity at base of cushion, margin irregularly fringed or erose; hypochile yellowish green with purplish red margin, helmetlike, about 5 mm tall, about 5 mm in diameter. Shoe-Shaped Belly-Lip Orchid is seen on tree trunks in forests at altitudes of 1000-2700 m, in the Himalayas, from Nepal to NE India, China, Malaysia, Myanmar, Thailand, Vietnam, Philippines. Flowering March-April. Identification credit: Nimesh Chamling Photographed in Barsey Rhododendron Sanctuary, Sikkim.